Accommodations are NOT included in your conference registration fee. Use this link to book your hotel room for the Moravian Women’s Conference 2019. IMPORTANT: You should provide the names of any roommates when you make your reservation. The hotel can split the bill among all roommates when you check-in to the hotel. Fees will be charged to credit cards upon checkout. Be sure to let the hotel know you are attending the Moravian Women’s Conference to receive the special discounted conference rates shown below. *As of February 15, 2019, the Embassy Suites rooms are completely booked. 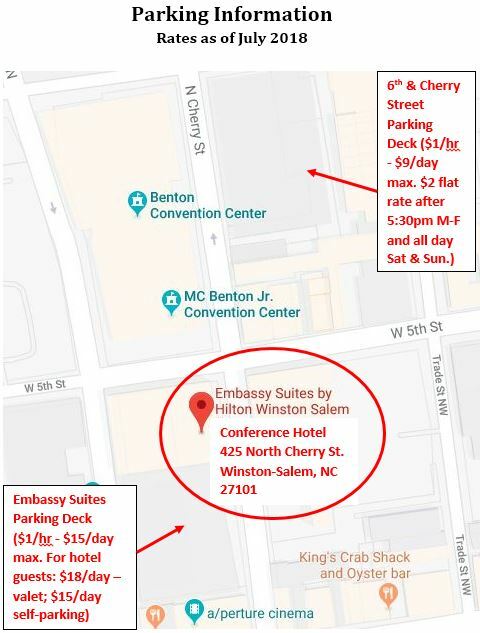 Limited rooms are available at the Marriott Winston-Salem, which is connected to the Embassy Suites by an elevated, enclosed walkway. 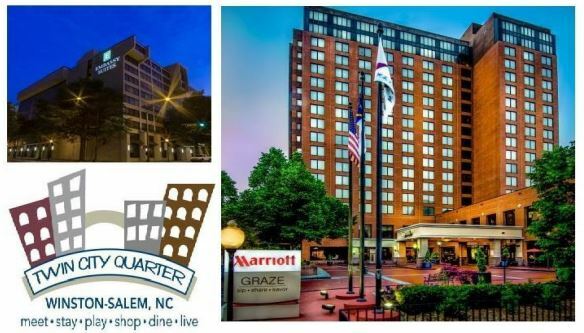 Lodging Example: You and three friends plan to share a double room at the Marriott Winston-Salem. Since there are four of you, you’ll split room costs four ways. For a double, divide $114 by 4 to get $28.50, the cost per person per night (plus taxes and fees). Multiply by 3 nights (Thursday, Friday, Saturday) and each person is responsible for $85.50 in hotel costs (plus taxes and fees). For two people in a King room, the cost per person would be $128.26 (plus taxes and fees) for the three-nights lodging. Need a roommate to share expenses? Complete the Roommate Preference section during conference registration and we’ll help you find one. You must make that request no later than April 30, 2019 so that we can assign you a roommate prior to May 15, 2019. The Embassy Suites hotel’s spacious suites offer private bedroom and separate living room with sofa bed. Amenities include a flat-screen TV, free WiFi internet access, refrigerator, microwave, coffeemaker and a well-lit dining/work table. Your Embassy Suites hotel rate includes a full cooked-to-order breakfast and Evening Reception (which includes appetizers and two beverages). The complimentary 24-hour business center offers guests WiFi access and mobile printing capabilities. The hotel’s amenities also include Glass Door Salon & Spa, a fitness center and indoor pool. The Marriott Winston-Salem offers standard, non-smoking rooms with either 2 Queen beds or 1 King bed. Amenities include TV, free WiFi, mini-refrigerator, coffee maker, iron, hair dryer, and work table. Breakfast at the Marriott (NOT included in room rate) is $15.95 + tax (0.0675 %); breakfast at Embassy Suites (if not staying there) is $17.05 + tax. Both are buffets. Guests in the Marriott are welcome to pay for breakfast in the Embassy Suites Grille. There is a climate-controlled walkway between the Embassy Suites and Marriott hotels. For more information about accommodations and amenities, visit the Marriott Winston-Salem and the Embassy Suites websites. The Piedmont Triad International Airport (GSO) in Greensboro, North Carolina is a 30-minute drive from downtown Winston-Salem. Raleigh-Durham International Airport (RDU) and Charlotte Douglas International Airport (CLT) are both within 2 hours (depending on traffic) from downtown Winston-Salem. You are responsible for your own ground transportation to and from Winston-Salem. Airport shuttle is offered by ABC Door-To-Door at specific pick-up times for prices ranging from $50 to $150 one way from Greensboro, Charlotte, or Raleigh airports. Riders need to make reservations but can pay at the time of service. They may combine riders with similar arrival dates and times to enable multiple passengers to share costs. More information about reserving shuttle rides will be available here in January 2019. Lyft and Uber also provide transportation from these airports, though costs will vary. Rental cars may also be obtained at any of the airports. On-street and surface lot parking is very limited. Parking is available in several nearby parking decks. See below for rates. Note you can still access the Embassy Suites hotel from the Cherry Street Deck without going outside via climate-controlled walkways.